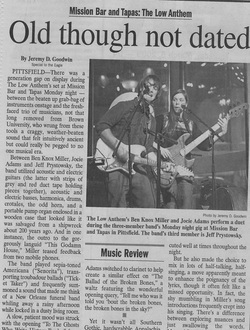 PITTSFIELD—There was a generation gap on display during The Low Anthem’s set at Mission Bar and Tapas Monday night—between the beaten up grab-bag of instruments onstage and the fresh-faced trio of musicians, not that long removed from Brown University, who wrung from these tools a craggy, weather-beaten sound that felt intuitively ancient but could really be pegged to no one musical era. Between Ben Knox Miller, Jocie Adams and Jeff Prystowsky, the band utilized acoustic and electric guitars (the latter with strips of grey and red duct tape holding pieces together), acoustic and electric basses, harmonica, drums, crotales, the odd horn, and a portable pump organ enclosed in a wooden case that looked like it was salvaged from a shipwreck about two hundred years ago. And in one instance, the outro to the gorgeously languid “This Godamn House,” Miller teased feedback from two mobile phones. The band played sepia-toned Americana (“Senorita”), transporting troubadour ballads (“Ticket Taker”), and frequently summoned a sound that made me think of a New Orleans funeral band whiling away a rainy afternoon while locked in a dusty living room. A slow, patient mood was struck with the opening “To The Ghosts Who Write History Books,” from the band’s great 2008 album “Oh My God, Charlie Darwin.” The mood was dominated by the synergy between Miller’s softly crying harmonica, Adams’ carefully plodding, underwater drumming and Prystowsky’s evocation of the titular ghosts on the pump organ. After the short game of musical chairs that bridged each song this night, “Charlie Darwin” (with Prystowsky moved to upright bass and Adams to the crotales, a series of tuned brass discs she bowed to create a sort of eerie, sad singing effect) went right for the bone. It was thrilling to hear Miller shift into falsetto for this existential lament, seemingly evoking a Genesis in which there’s no Creation (“Oh my god, the water’s cold and shapeless/ Oh my god, it’s all around”). When Adams and Prystowsky joined in for vocals on the chorus, the band was a finely tuned machine creating pretty, chilly dread. Yet it wasn’t all Southern Gothic, hardscrabble Appalachia, and parlor room séances. (And what really is, these days?) The band spliced in some ramshackle rock as well, such as the thrashing take on gospel number “Don’t Let Nobody Turn You ‘Round,” on which Miller hammered at the drums, Prystowsky turned in the bass performance of the evening on the upright, and Adams scratched at the electric guitar while joining Miller for some ragged, shouted vocals. In this context, it sounded like punk rock. They made a similarly wonderful racket on “Home I’ll Never Be,” a Tom Waits song fashioned from a Jack Kerouac lyric, though this time Prystowsky sat behind the drums, Miller played electric guitar and Adams played electric bass. Miller was in full-throated, scratchy voice mode, which he executed well at times throughout the night. But he also made the choice to mix in lots of half-talking, half-singing, a move apparently meant to enhance the poignancy of the lyrics, though it often felt like a missed opportunity. In fact, the shy mumbling in Miller’s song introductions frequently crept into his singing. There’s a difference between exploring nuances and just swallowing the words. Meanwhile, Prystowsky’s backing vocals were often subtle to the point of inaudibility. Though a Neil Young influence was most pronounced on quiet tunes like “Charlie Darwin,” The Low Anthem took other chances to fashion their own sort of ragged glory, such as in an inspired, full-speed stumble through Leonard Cohen’s “Bird on a Wire” to close the 78-minute show. A handful of new songs, including “Cigarettes and Whisky,” leaned heavier on the ramshackle rock element, and after a couple tastes felt more ordinary to me than the band’s truly transporting work featured elsewhere in the show. Most of the time, the band made a sound that was peculiar but familiar, sad but exhilarating, old but not dated. Oh my god.